The insect known as Douglas-Fir Tussock moth began showing up again around the Denver Metro Area in 2015; it pops up in sporadic pockets in landscapes and parks. 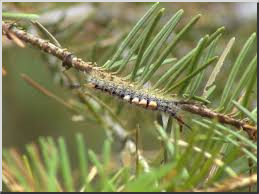 The larva of this insect feeds on needles of Spruce, Douglas-Fir, White Fir and Concolor Fir. The feeding of this larva typically begins at the top of the tree and moves downward. Feeding can become extensive and complete defoliation may occur. Douglas-Fir Tussock moth larva hatch in the spring and move toward the soft, newly emerging tissue to begin feeding. Feeding by the larva will occur from May to late July, when pupal cocoons form. The adults emerge in late July-August, and begin to mate and lay eggs. The egg masses will overwinter and hatch in the spring. There are several natural predators of Tussock moth which help to keep populations from becoming too heavy. This insect population can grow enough to impact small groups of trees in a localized population. Insecticide applications can provide good control where populations have reached damaging levels. It is important to look for, and positively identify, this pest so proper treatments can be applied where needed. 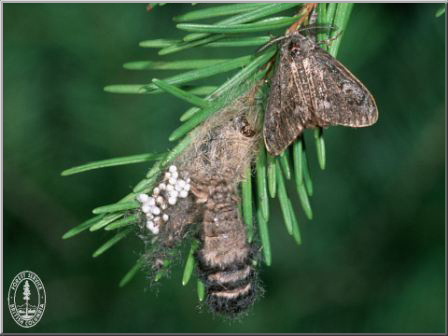 Locating egg masses in the winter is a good sign that a population of Douglas-Fir Tussock moth has taken up residence in an area. Click here for the Tree Top Times Blog. Bugs, varmints and diseases to watch out for this season. 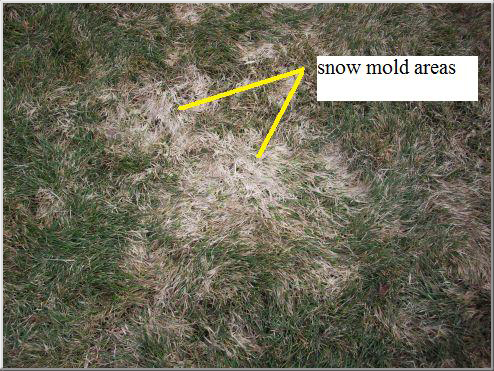 Snow mold may become a problem if we do receive any more snow and it can cause considerable damage to your grass. The best thing to do is gently sweep any areas with a broom or leaf rake to loosen up the mold and allow the area to dry out. Gently fluff as needed. Always make sure to clean up your leaves in the fall. 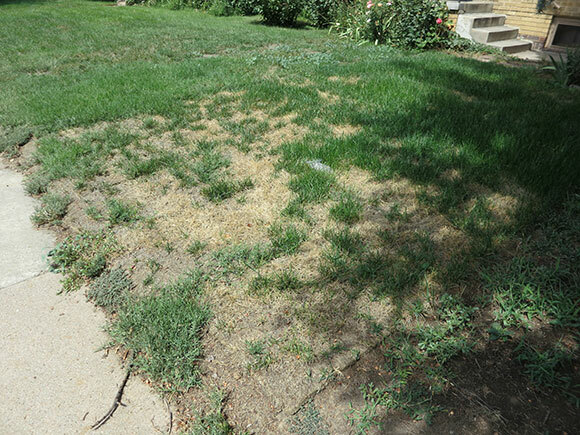 Leaving them all winter can cause mold and will also kill your grass. Lawn mites will continue to plague us this season: look for dry, brown crunchy grass patches that spread. You can find mites on south, southwest facing exposures as they receive the most sunlight making for a mite motel. If you are having problems now, please contact us for a free evaluation. More often than not, winter watering or watering when then temperatures are above 40 degrees will help with this problem. Our front range weather has not supplied us with enough moisture to really hinder the breeding of the mites, so it stands to reason that we may have to help out with the watering situation. At the first sign of Japanese beetles, call us as soon as possible.This beautiful but devastating pest can decimate a yard quickly. They cause damage in larval and adult stages. 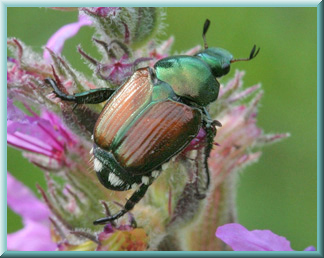 The adult Japanese beetle will start appearing as early as June (may be even earlier this year) and begin feeding and breeding through July and into August. Control strategies should target both larval and adult stages. Voles are running amok at this time. It is unusual that voles are a problem in the spring/summer months but they have been increasing in populations for a few years now. 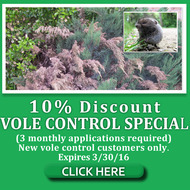 The hard thing about vole control is when 3 or 4 neighbors have voles and they don’t all treat, it makes control very difficult to achieve. It also is not in the best interest of your pocketbook to only treat once, as they have nests with babies! That is why we have set our policy that a minimum of three treatments are necessary. Rabbits can cause severe damage as well. It is best if you don't cultivate them as "cute" animals in the back yard by feeding them. There is no perfect solution to getting rid of rabbits; you can try netted fencing, rabbit repellents and removing places that they can hide. If they have nowhere to hide, they will find a new breeding/feeding ground. Click here for more on lawn care. 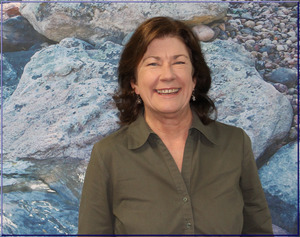 Becky has been with Mountain High since 2004 where she performs administrative, research and other work for the sales crew. Working for up to 7 sales guys keeps her very busy. She is a busy mom of 2, with 1 daughter who is an artist extraordinaire and her son who is a computer guru (Happy 16th birthday Nick! Wait, Happy 21st birthday to Lexi!) She cherishes her time spent with her entire family. Becky is also an avid reader. I think she has an undiscovered talent as a photographer, a work in progress! Becky's knowledge of our industry is extensive, which makes us very lucky to have her at Mountain High Tree! Mountain High Helps! If you would like to donate to the Childhood Diabetes Foundation, Mountain High Tree will match up to $500. Click on the link above for more information. 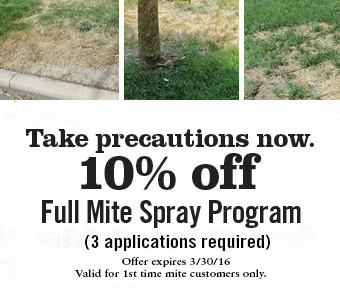 A dry and warm February has resulted in heavy lawn mite populations. Watering the area where the damage is occurring can help to reduce the impact to your turf. The worst areas are typically the patches of turf where the snow melts off first. These areas receive more heat which helps to foster the mite population. Mountain High is quality service from start to finish. Great help from Bill Tillapaugh, excellent pruning by Khoa Vo and Jose Barrios. Top quality work. Dependable backup if problems arise. how well they cleaned up. Professional and pleasant staff. Quality work performed. Polite, thorough, well trained professionals. 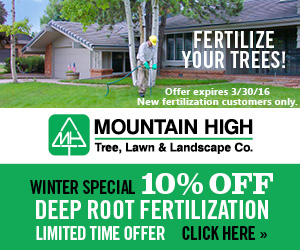 After years of using Mountain High's tree pruning and tree care, I would use no one else! In Colorado Springs, Mountain High is proud to be a sponsor and partner with Pikes Peak Urban Gardens (PPUG). March is the time to start prepping your vegetable gardens for planting in later spring. PPUG offers the following suggestions. Apply a layer of compost now so soil organisms have time to break it down so it is ready for plants. A general rule is to add a 2-inch layer of compost to the garden beds and work it down 10 inches into the soil. Manures tend to be high in salts and too much salt can damage your plants. If you use a manure, use less and apply only every 3 years. Also, a good practice is to top dress your beds with dry molasses, which can help feed the​ beneficial microbes in the soil. Finally, moisten your garden beds and then mulch with a 3 inch layer of straw. This will keep the soil hydrated until you are ready to plant. Your garden beds are now ready until spring finally arrives. Go to Pikes Peak Urban Gardens website at www.ppugardens.org for more great information on gardening in Colorado Springs. *NEW* Colorado Springs Blog Site! Click Here. If you would like your trees checked, please call our Colorado Springs office at 719.444.8800 or click on the estimate request below for a free evaluation.